It is truly amazing how much work a group of motivated, enthusiastic and hard-working volunteers can achieve in just a few short hours. On June 29, my site partner Michael Paccassi and I organized a salmonid habitat enhancement event along San Geronimo Creek. This project, called an Individual Service Project (ISP) in AmeriCorps lingo, was a requirement during our term of service with the Watershed Stewards Project (WSP). On paper, this event seemed like only a small piece of our mandated work for the ten months we’ve spent at MMWD, but in reality it was a perfect snapshot representation of everything we have done throughout our time here. The majority of our work has been “stream restoration,” which at the water district includes spawner surveys, smolt trapping, snorkel surveys, analysis of engineered woody debris habitat, and the ensuing data entry. As a result, we in a way have been inducted into the fragile lives of the endangered coho salmon and have formed an intimate relationship with all of the factors that they depend on for survival. Consequently, the work our volunteers completed during our ISP was directly related to these important aspects of a salmonid’s habitat. Another large piece of our required work has been community outreach and education. We developed and taught a six-week curriculum to third and fifth graders at a Title One school. The lessons were based in environmental science and included the relationships between watersheds, the water cycle, fish biology and human activity. The key messages of this curriculum were also shared at multiple outreach and community volunteer events throughout the year. The skills we gained by engaging with the public and communicating WSP’s mission were crucial in our recruitment of over 30 volunteers for the San Geronimo Creek project. Of course it certainly helped to already have so many dedicated MMWD volunteers! We were so excited to see such a strong community turnout at the event. In addition to some familiar friendly faces from other MMWD volunteer events, we also had a great turnout of new volunteers. The landowners’ property that we worked on was the perfect fit for a volunteer project such as this, not only because of the manageable projects it presented, but because it showed community members how they can make a difference on their own properties and most importantly because of the graciousness of our hosts. We all banded together to tackle the invasive plants that were growing throughout the riparian corridor and squelching the vital native species that contribute to the habitat that salmonids need for survival. After eradicating the vinca, cape ivy, English ivy, Japanese knotweed and others, our group replanted the entire riparian area with fast-growing native trees, shrubs and perennial plants that, if all goes well, will take hold and restore the biodiversity needed for complex habitat and stable, non-eroding stream banks. Before, during, after: Volunteers did a fantastic job of eradicating the Japanese knotweed and squelching the English ivy. Thanks to a donation from Good Earth for breakfast, lunch from MMWD, and cookies and watermelon from the landowners, our volunteers were rightfully rewarded for their hard work. We could not have asked for a better group of volunteers! In all honesty, I at first doubted the point of an ISP at the beginning of the WSP term. It seemed so unrelated to the overarching basis of our work here in MMWD’s Fisheries Department. In retrospect, it encompassed everything: endangered species protection, community outreach and education. Not only were we working to improve riparian habitat for the benefit of the coho salmon and steelhead trout, but we were doing so through community organization and action. These principles are laced within WSP’s mission, and we strongly believe that they also will be carried with anyone who has been involved with our program during the past ten months, whether through our education curriculum, field surveys or volunteer events. Check out MMWD’s Facebook page for more photos of the event! Join Us for a Salmon Habitat Enhancement Event June 29! As AmeriCorps members with the Watershed Stewards Project, we have had the unique opportunity to work with MMWD biologists in helping to protect, monitor and educate the public about the importance of salmonids like the coho salmon and steelhead trout. Though we aren’t all given the opportunity to work so closely with these beautiful and unique fish, as members of the community and stewards of the land we all share the responsibility of ensuring the survival and well-being of these endangered and threatened species. Guess what? You’re in luck, because we’ve organized an event that will provide the community of Marin with the opportunity to do just that! MMWD and the Watershed Stewards Project want to welcome you to a special riparian habitat enhancement project happening along the San Geronimo Creek. Come out and join us this Saturday, June 29, from 9:00 a.m. to 2:00 p.m. to show your support for the salmon you all know and love! To encourage habitat recovery and reduce stream bank erosion, we will be removing non-native and invasive plant species along a section of the San Geronimo Creek. We also will be replanting with native California plant species and using tree shelters to encourage the growth of larger trees to provide shade and habitat for our finned friends in the creek. We will meet a little before 9:00 a.m. across from the Two Bird Cafe at 625 San Geronimo Valley in San Geronimo. All ages are welcome, so please bring the whole family. Tools, water, snacks and lunch will be provided. All you need to bring is a pair of sturdy boots, some sun protection, a reusable water bottle and your enthusiastic, hard-working self. To pre-register or for more information about this unique opportunity, contact us at volunteerprogram@marinwater.org or (415) 945-1188. 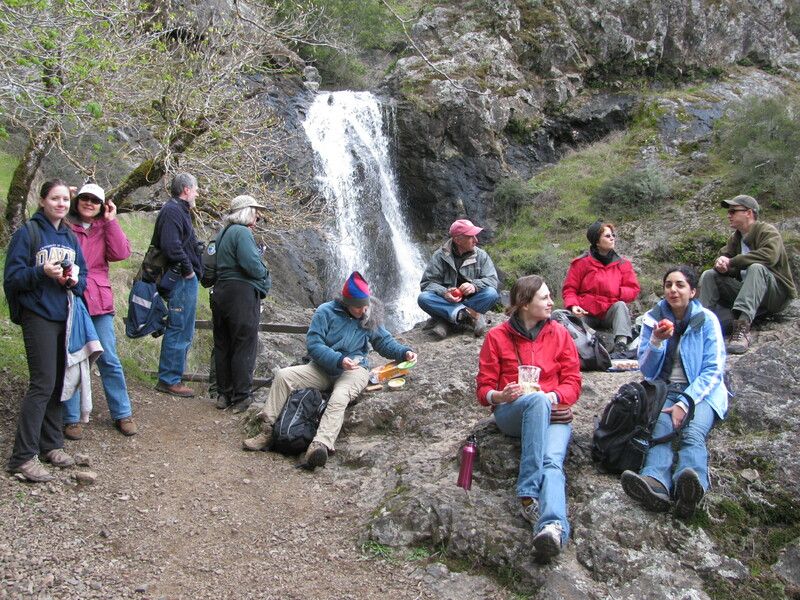 Volunteers gather at Little Carson Falls. We are approaching the exciting time of year when MMWD’s Frog Docent program returns. 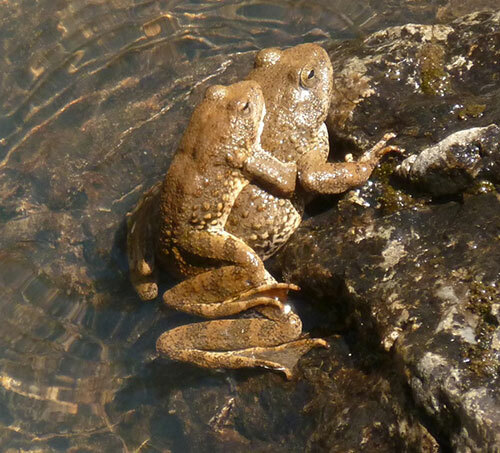 The foothill yellow-legged frog (FYLF) is a federally listed species of “special concern,” and here in the Mt. Tamalpais Watershed we have only two remaining breeding sites for a species that is in decline throughout its range. The habitat at Little Carson Falls also happens to be a popular destination for hikers, mountain bikers and dog-walkers. Because of this, it is vital to have enthusiastic people at the falls to educate visitors about the importance of protecting this special spot and its inhabitants. This is where our volunteers come in. They have helped MMWD educate hundreds of visitors about the FYLF, why it is important to respect and protect their habitat, and gather data that has helped professional herpetologists monitor the population of the frogs. Foothill yellow-legged frogs in amplexus. Photo by Frog Docent Matthew Sykes. The coming season looks promising for this unique program; we have had a few good rains so far, and for those who have been out on Azalea Hill, you may already know that this means that the falls have lots of water! In my opinion, there’s no better place in the watershed to volunteer. We will have our initial training day for Frog Docents on Saturday, March 2, from 9:00 a.m. – 2:00 p.m. at the Sky Oaks Ranger Station in Fairfax. We’ll start off with some refreshments and a presentation from one of the biologists who is working with the district on compiling and analyzing the data gathered by our volunteers. We’ll then hike up to see the falls. Volunteers will sign up for their weekend time slots (March-June) at Little Carson Falls through Google Calendar. This will be a great opportunity to meet like-minded nature enthusiasts, help out a species in need, be active and spend time outside—so many New Year’s resolutions packed into one! For anyone out there who wants to band together to protect this important native frog species and form a community of wildlife stewards, this program is for you. Please tell your family, friends, coworkers and neighbors so that they can join in the fun too! We love and are always looking for new volunteers. No special skills or experience are needed, but volunteers must be 18 years or older. If you have any questions, comments or want to sign up for our training, email us at volunteerprogram@marinwater.org or call (415) 945-1128!